We carry exclusive products from Tarkett and Engineered Floors. As a MultiFamily Solutions member, we are the first in San Diego to offer a new and exclusive fiberglass- backed sheet vinyl product to the property management industry. The product is called Tarkett Starters® and we recommend it to our multifamily customers almost exclusively, because the benefits of installing a glue-less product allows for the vinyl to be pulled up, dried and reinstalled should there be water leaks or plumbing issues. And because it’s adhesive-free, it’s also a certified green product. Starters® comes with a 10-year warranty and has been upgraded with modern design patterns making it very attractive to new tenants. Among the other benefits you can expect are reduced labor and floor prep costs, as there is no longer a need for pull up. 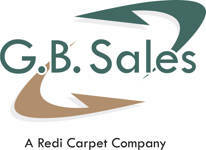 GB Sales offers a carpet line from Engineered Floors designed especially for the property management segment. Engineered Floors built state-of-the-art carpet manufacturing equipment in order to produce a premium PET carpet that is inherently stain resistant. FHA approved and green certified by the Carpet & Rug Institute, it is by far the best performing carpet for the money and available in 26, 30 and 35 ounce face weight. It has a greater twist to enhance the performance while still providing a luxurious look and feel… and all at the most competitive prices in the industry.